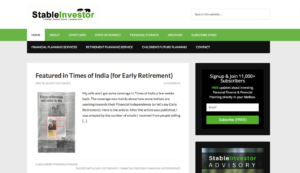 If you are looking for few best Indian stock market blogs to follow, then you have reached the right place. 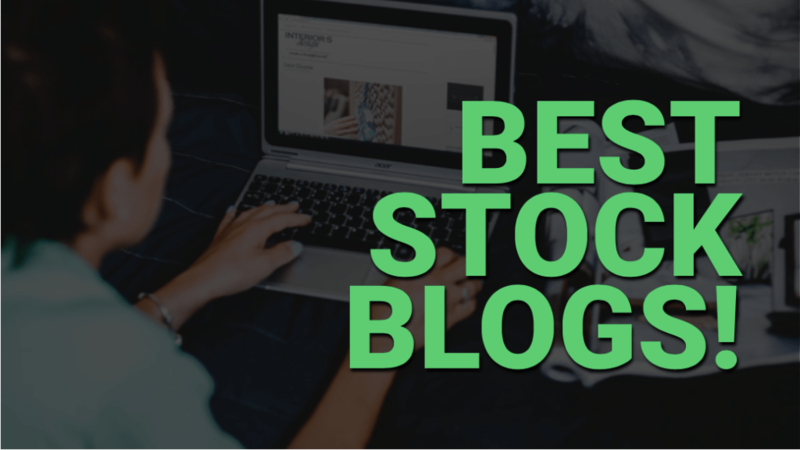 Although there are hundreds of stock investing blogs in India, however, in this post we have hand-picked 7 best Indian stock market blogs that every Indian equity investor should follow. (Quick note: Please read this post till the end as there’s a bonus in the last section of this article). Get money rich (GMR) blog is run by Mani (founded in 2008). You can read a number of interesting articles regarding stock investing, mutual funds, real estate, income tax, personal finance etc on this blog. This blog keeps analyzing new stocks and if you’re a beginner (or even a seasoned investor), you can read these articles to understand how to analyze stocks, which factors to consider and how to find whether a stock is undervalued or overvalued. Here’s a list of few recent stock analysis by Get money rich blog. 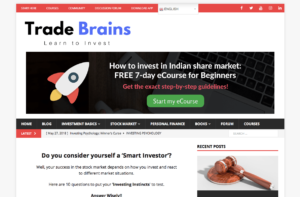 Because of it’s simple and easy to understand contents, it’s one of the best Indian stock market blogs to learn to invest in stocks alongside boosting your additional financial insights. This blog is managed by Prof. Sanjay Bakshi. He teaches MBA students (at MDI Gurgaon) two popular courses: “Behavioral Finance & Business Valuation” and “Financial Shenanigans & Governance”. 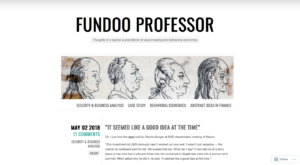 On fundoo professor blog, Mr. Bakshi shares his thoughts as a teacher & practitioner of value investing and behavioral economics. 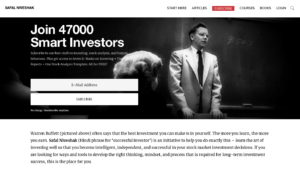 This blog consists of hundreds of free amazing lessons on investing and human behavior. It’s a great read for the Indian investors to build a strong investing foundation. ‘Safal Niveshak’ means a ‘successful investor’. This blog is managed by Vishal Khandelwal and Anshul Khare. Vishal has 15+ years of experience as an investor. The Safal Niveshak blog is focused to help the small investor, become intelligent, independent, and successful in your stock market investing decisions. They have a newsletter of over 47,000+ subscribers. 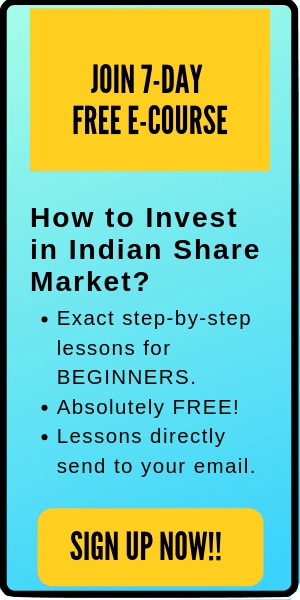 You can find many valuable investing lessons on this blog which definitely makes it one of the best Indian stock market blogs. Also read: 7 Best Stock Market Apps that Makes Stock Research 10x Easier. This blog is managed by Nitin Bhatia, who covers areas like Investment, Insurance, Stocks, Mutual Funds, Credit Score, Taxation, and Business Start-ups. They also run a youtube channel with over 290,000+ Subscribers. Stable Investor is run by Dev Ashish, a SEBI Registered Investment Advisor. This blog is focused to help people invest sensibly to achieve financial goals, get their personal finances in order, invest profitably in stocks. Stable Investor has over 11,000+ Newsletter subscribers. Stable Investor also provides various financial services like financial planning, retirement planning, children future planning etc. 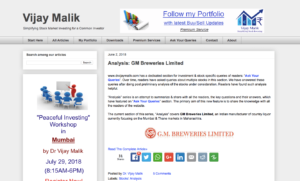 This blog is run by Dr. Vijay Malik, a SEBI registered analyst. He has been actively involved in the Indian equity markets since 2006. The articles on his blog attempt to simplify the process of investment decision making. Dr. Vijay Malik blog provides premium services like ‘Peaceful investing’ workshop, stock analysis excel sheet, ebooks etc. 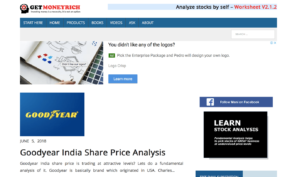 You can also read the analysis reports of various stocks published on this blog for free making it worth mentioning in our list of best Indian stock market blogs. Trade Brains was founded by Kritesh Abhishek, an NIT Warangal graduate, in Jan 2017. It is a fastest growing Financial Educational Blog in India with over 18,000+ newsletter subscribers within a year and half of inception. Trade brains blog is focused to teach stock market investing and personal finance to the DIY (do-it-yourself) Investors. 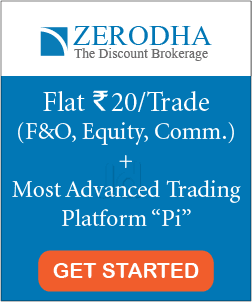 You can also learn stock market investing in Trade Brains’ recently launched android mobile app. Here’s the link to download the app on play store. Besides reading blogs, watching videos is also a good alternative to learn to invest. 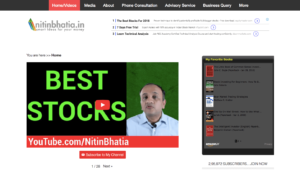 As a bonus, here are two amazing Indian stock market youtube channels that you can subscribe for free to learn to invest in stocks. This is a popular youtube channel to learn technical analysis. Market Gurukul has over 200,000+ subscribers and +170 videos on their channel. FinnovationZ creates easy to understand video contents for beginners. Most of the videos on this channel are in Hindi and hence comfortable to grasp for the native speakers. FinnovationZ has over 270,000+ subscribers on their youtube channel. Quick Note: If you think we missed any astronishing blog on our list of best Indian stock market blogs, feel free to comment below. We’ll be happy to include it on our list if it’s worth adding. Cheers!